Great Britain breaks off diplomatic relations with Romania as it is now clear that the Romanians are firmly allied to the Germans. Norwegian Lutheran bishops denounce Nazi brutality. Churchill broadcasts to the nation and says the Mediterranean will close to all allied shipping. Singapore surrenders to the Japanese, a decision prompted as much as anything by the plight of the 1,000,000 civilian inhabitants of the island. 9,000 British, Australian and Empire troops are killed and 130,000 captured, many of which will find themselves working as slaves on the notorious Burma-Thai Railway. The Japanese casualties’ amount to around 9,000 killed or wounded. “Enemy aliens” ordered to be removed from restricted military zones in California. British Eighth Army arrives at German Mareth Line in Tunisia. 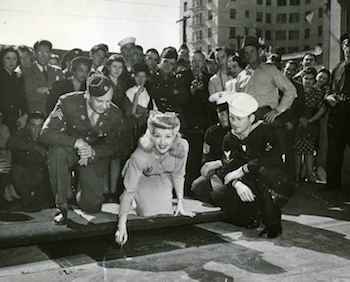 Actress and pin-up girl Betty Grable leaves prints from hands & one leg at Grauman’s Chinese Theater in Hollywood. Monte Cassino is devastated by 422 tons of bombs as the Indian and New Zealanders begin their offensive to capture the monastery which is now occupied and defended by paratroopers (the Green Devils) of 1st FallschirmjÃ¤ger Division. Hitler permits Field Marshal Models troops to withdraw to Panther Line and also allows the Korsun pocket defenders to break out towards the relieving forces. The heaviest raid ever on Berlin is conducted, during which 2,500 tons of bombs are dropped. The USAAF decimate a Japanese convoy off New Ireland. Japanese forces are now trapped in the Manila rectangle, which is just 5,000 yards by 2,000 yards. US Sixth Army lands at Mariveles on tip of Bataan peninsula on Luzon, takes Mariveles and its airfield. As Japanese advance, US Fourteenth Air Force evacuates last of its eastern China airfields, can no longer raid South China Sea. Russian troops are now covering the approaches to Danzig. The Red Army captures Sagan in Silesia. The German 11th SS Army begins a counterattack ‘Operation Sonnenwende’ with three Korps (39th Panzer, 3rd SS Panzer and the 10th SS Korps). However, only the 3rd SS Panzer Korps (11th SS Panzer Grenadier Division”Nordland” and the 27th SS Grenadier Division “Langemarck”) are ready and begin their attack South towards Arnswalde,about 30-35 kms southeast of Stargard.